I’ve tried every single iOS client for iOS and for some reason I’ve decided for various reasons I’ve disliked something about them all except Apple mail enough where I stopped using them. As someone with a few lingering quirks from OCD, I can be very picky when it comes to apps. This is doubly so with email and RSS reader apps. 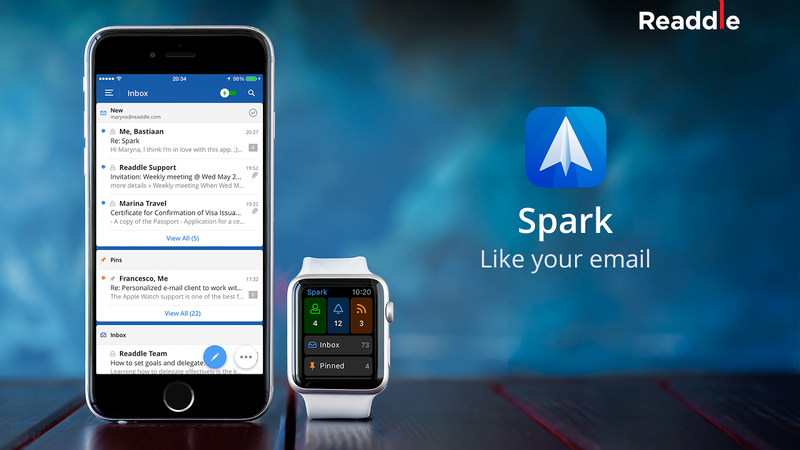 The newest email client is one I’ve ended up absolutely loving, Spark from iOS developer Readdle. Spark features a really powerful smart mailbox with commonsense groups. It tries to group emails into 5 different categories: New emails – emails you want to see most, Notifications, Newsletters, pinned emails, and your overall inbox. Each one of these categories can be viewed 3 different ways: a unified email box with all your accounts funneled in, grouped emails for each inbox, or each inbox separately. You can choose to customize your preference for each one. So you can have all your important mail grouped by individual inbox and all the store emails you get lumped together. Its smart enough to know that you’re probably going to want to be looking at a job site’s email rather than put it in the newsletter section. Email actions in your inboxes is based on half or full swipes so getting through unwanted emails, pinning them, or archiving is quick and ready. Spark also gives you access to the full mailboxes of all included email accounts. The search is powerful is has natural langue support. What really makes Spark special is the customization and integration with other services. Its highly compatible with Google Gmail, MS Exchange, MS Outlook, Yahoo, iCloud, and quickly and easily sets up any custom email servers. Same story with cloud services. You get Dropbox, Google Drive, Box, MS OneDrive, Evernote, OneNote, Readability, Pocket, and Instapaper. The client is compatible with 1Password and LastPass extensions which makes signing in to these services very easy. Most of the interface is customizable as well. You can rearrange the top and bottom sections, add new categories, change what the swipes do and add widgets. The only real widget available is currently for the calendar, but there’s quite a few more coming soon like access to your Apple and Amazon accounts, flight information, packing tracking, weather, and even statistics information. Spark has the potential to become a lot better than it is and its already the best email client I have ever used. Readdle left no stones uncovered. Yes, there’s even an Apple watch companion app. When it comes to flaws, I’m hard pressed to find them. It functions exactly how my work flow wants an email client to be. If there’s an achilles heal at this point its that the apps is iPhone only at that stage. If you’re on a iPad and you don’t want to run an iPhone app, you’re out of luck. given Readdle’s history though, I would expect a universal version to come eventually. Readdle’s apps usually trend towards the $3-10 range range and I would have gladly paid that price in a heartbeat. Readdle had other ideas and is offering it totally for free. For $10 it would have been a bargain for its functionality, free there is no reason not to download Spark. Like all iOS apps you can grab it exclusively from the Apple App Store. It does’t happen very often, but Spark is an app I can full get behind. Its what an email app should be. Its feature packed, customizable, fast, and you can’t beat the price. It also makes you more productive. What are you waiting for, go download it now!